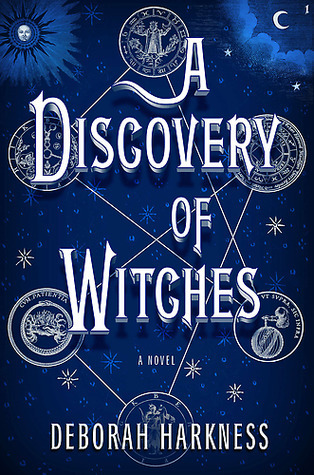 I read A Discovery of Witches by Deborah Harkness over two years ago. This bad boy is over 800 pages long and a million books later, I felt I was too fuzzy on the details to read The Book of Life, the last book in the trilogy, which recently came out. With a lack of free time, I decided to rent the audio book from the library and listen to it while driving. I’m so glad that I did because even though I remember quite a bit, there was some things that I forgot. I also think I made some ‘discoveries’ that I didn’t pick up on the first time around. Diana Bishop is a witch that wants nothing to do with magic. After her parent’s tragic death, Diana feels that the cost of magic is too great. She has earned everything she has the old fashion way, through work. While working in Oxford’s Bodleian Library on a presentation, she comes across a magical book. Not wanting to have anything to do with it, she returns it back to the stacks. But her discovery sets a fantastical underworld stirring, and a horde of daemons, witches, and vampires soon descends upon the library. Enter Matthew Clairmont (sigh). Matthew Dreamy Vampire Clairmont. He like all the rest of the creatures wants the book but not so much for the power it holds. He wants to know if the book can explain why the creatures are dying. Dr. Clairmont is a scientist, in addition to being a 1,500 year old vampire, and he feels the creatures are on the verge of becoming extinct. Witches aren’t as powerful as they use to be, daemons are more insane than genius, and vampires are no longer strong enough to change humans into vampires. One thing is for sure, Diana wants nothing to do with any of this. So, to be fair, I have a M.A. in History. I love, absolutely love all the history in this book. I love how the history is intertwined with the fiction. Although I’ve read other reviews that said the history and science were painfully slow. But I absolutely enjoyed Harkness’ description of Diana’s historical work and Mathew’s research. I love the rich lore that Harkness developed as well. This is definitely a much more sophisticated novel and not geared toward those who normally read young adult. A Discovery of Witches was read by Jennifer Ikede and holy cow man did she do a phenomenal job. Each charter’s voice was unique and distinctive, not to mention all the different accents. I can’t wait to listen to Shadow of Night next. This entry was posted in Adult Fiction, Magic, Vampires, Witches and tagged A Discovery of Witches, Adult Fiction, Deborah Harkness, Diana Bishop, Jennifer Ikede, Matthew Clairmont, Vampires, Witches. Bookmark the permalink. I have the first two books in this series, but I’m waiting until the third comes out in paperback before I read them all together. I’m very excited for this series! I have not heard anything negative so far, but I am quite scared by the length of these books. I really hope they’re not too dry a read.